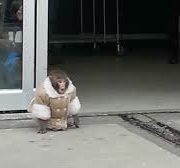 TORONTO – Yasmin Nakhuda, former owner of Darwin the Ikea monkey, has reportedly acquired two new Japanese macaque monkeys. Darwin, a baby Japanese macaque, was rescued by Toronto Animal Services and rehomed to the Story Book Farm Primate Sanctuary after he was found loose in an Ikea store parking lot in 2012. Nakhuda lost a lawsuit that sought to have Darwin returned to her. Although Toronto bylaws prohibit owning primates, Nakhuda now reportedly lives in the Kawartha region, which does not have bylaws against owning monkeys. Veterinary evidence strongly suggests that primates do not make suitable pets. Yet in many municipalities in Ontario, dangerous animals like primates, large cats, and large snakes and other reptiles can be legally kept without a license, and with virtually no oversight. Private pet collections and roadside zoos are the tragic result. According to a post on a Facebook page run by Nakhuda supporters, Nakhuda recently purchased the two monkeys from the former Northwood Zoo, which is up for sale. Ironically, Story Book Farm Primate Sanctuary is seeking to purchase the former Northwood Zoo property to expand its operations and be able to rescue more monkeys.